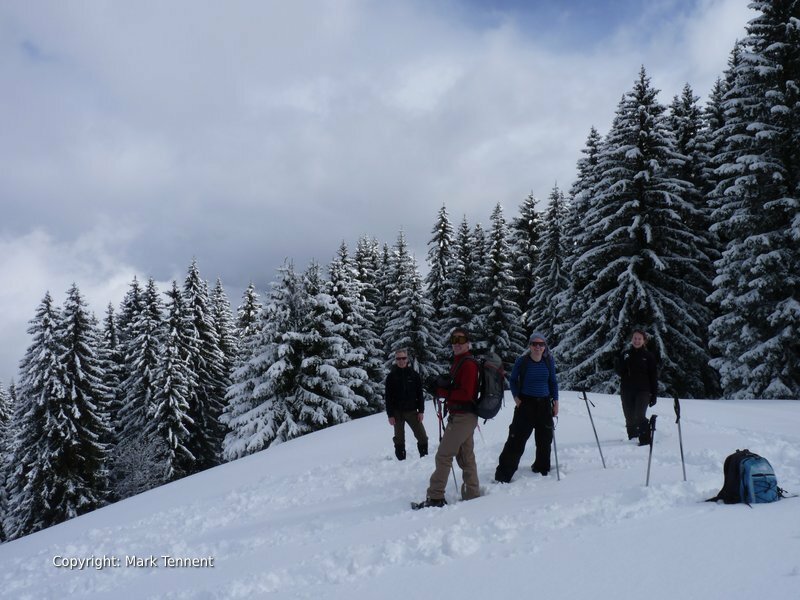 3 days guided snow shoe walking / 3 nights in the heart of the Beaufortain Mountains. Hotel based: an authentic, charming, family run, Savoyard hotel located in the village of Arêches. 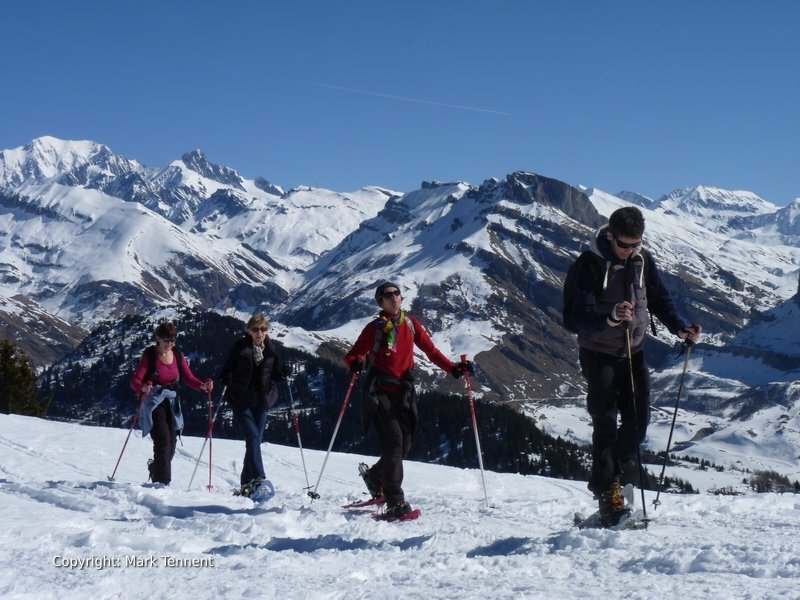 This 3 day snow shoeing holiday will open your eyes to the wonderful mountains and landscapes of the Beaufortain. The Beaufortain mountains adjoin the Mont Blanc mountain range. This proximity typically gives it an exceptional snowfall. 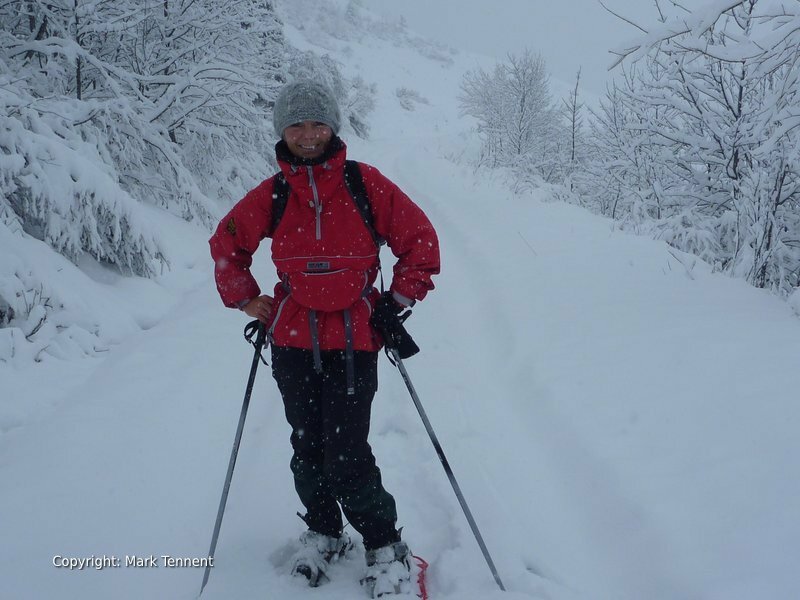 You will be spoilt for choice for the variety of snowshoe walks. 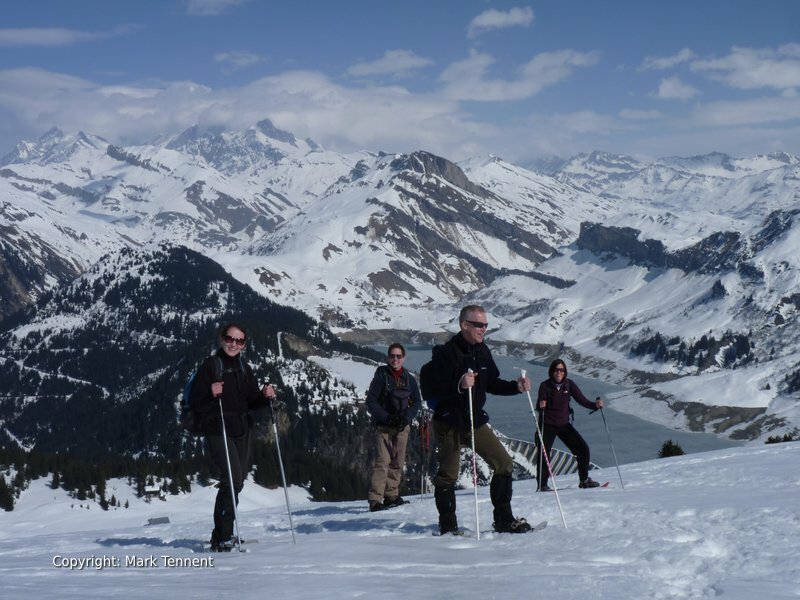 Our base at Areches-Beaufort gives us access to a superb choice of snowshoeing routes to suit everyone. Amazing views over the still waters of lakes nestling in the mountains. The hush of the forests, sounds muffled by the deep, fresh snow. 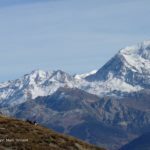 Views of the surrounding mountains of the Beaufortain and beyond Mont Blanc and the Aravis. The Beaufortain retains an authentic charm where traditional Savoyard wooden chalets blend into the hillsides. You will smell woodsmoke wafting in the crisp mountain air and see curling from the cosy wooden chalets. The Beaufortain are cut off in winter except from Albertville and over the Col des Saisies from Megeve. 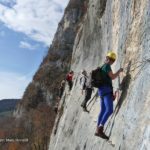 It is famous for an annual ski-mountaineering competion, the Pierra Menta. 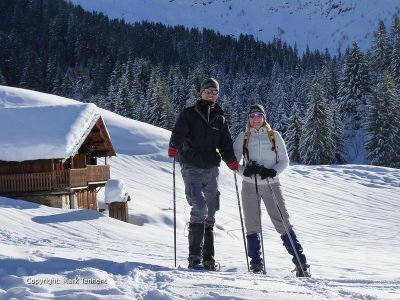 Our snowshoe holiday is based on a small, family run hotel, Les Ancolies, in the village of Arêches (c.1000m). The village of Areches-Beaufort is a real, authentic, Savoyard village without the trappings of the large resorts and “lives” year round. Les Ancolies is situated right in the centre of the village with a sunny terrace and cosy bar area. Dinner is served in the dining room and you can enjoy the local Savoyard specialities cooked by the hotel’s owner, Ludovic Blanc, recognised for his great cooking. Breakfast is taken adjoining the bar where you can enjoy fresh croissants, bread and a choice of cereals. The village has a number of shops including a boulangerie and one selling the local cheeses including the famous Beaufort itself. 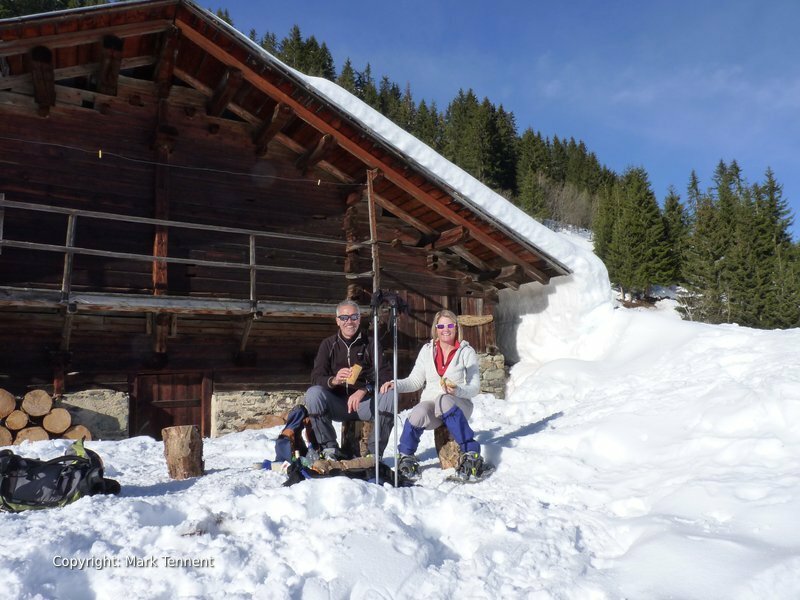 Areches-Beaufort has some ski lifts but it retains a small, family feel. It’s very much a village first and a resort second. The village of Areches-Beaufort is about 30 mins from Albertville and reached by a road that winds along the river Duron. 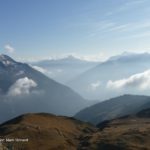 In summer it is possible to continue over the Cormet de Roselend and continue past Chapieux, on the Tour du Mont Blanc, to Bourg St Maurice in the Tarentaise valley. The road over the Cormet de Roslend is shut in winter just outside Beaufort and will not open again until the spring. Fri evening – Arrival at Geneva airport where I will meet you and take you to Arêches – Beaufort. Settle into the Hotel Les Ancolies**. Sat – The Col du Pre from Boudin. 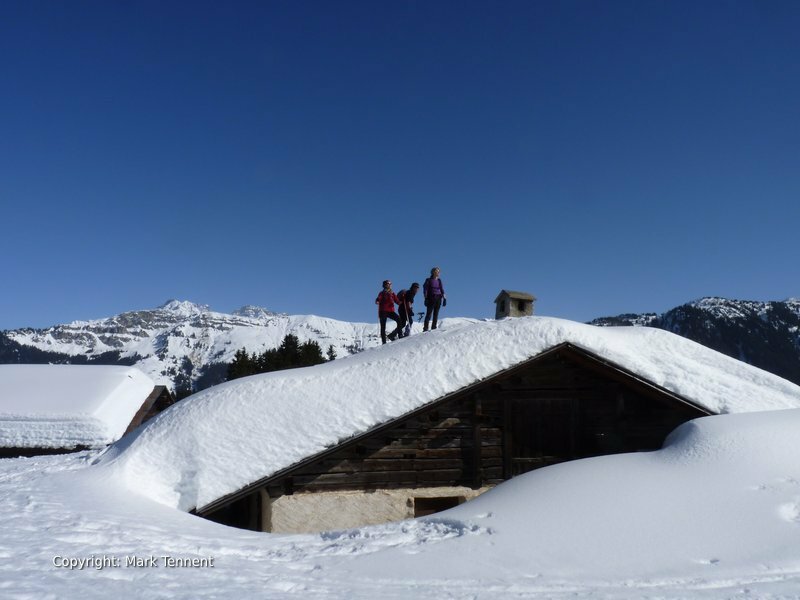 Our snowshoe outing for today starts from the delightful hamlet of Boudin a listed site for its local architecture. We will zig-zag up past snow-covered wooden chalets as we gain height. As we arrive at the Col du Pre a new vista awaits us including Mont Blanc. Below are the waters of the Lac de Roselend reflecting the surrounding mountains. Our snowshoes allow us to explore the area beyond the pass. Our only company other snowshoe walkers or may be the occasional ski mountaineer. 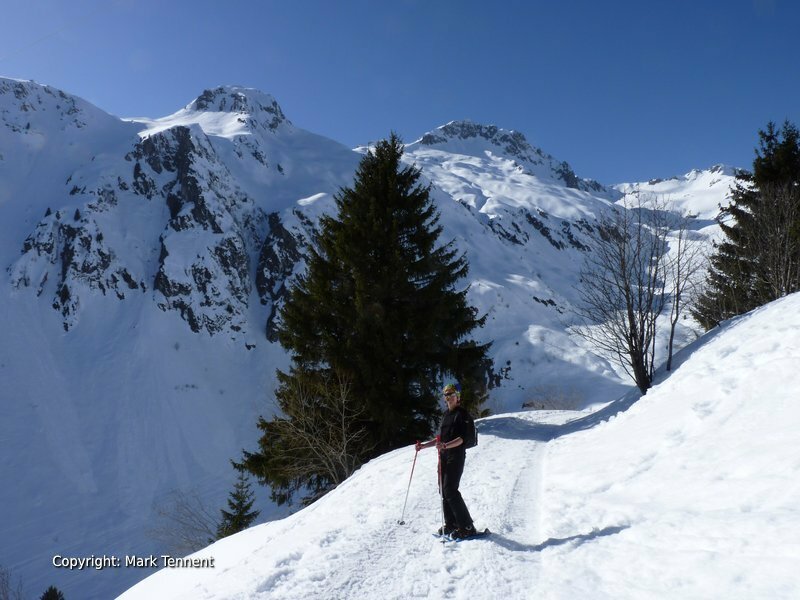 Sun – Today our snowshoes give us access to delightful snowshoe terrain in the direction of the Lac de St Guerin. The small road comes to an end, closed until the spring, and we don our snowshoes. A short distance later we cut up through clearings and pine forest to gain a plateau and some alpine chalets, deserted for the winter. 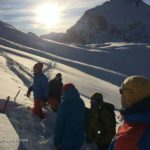 Our route on gives us views across to the Grand Mont and onwards to more remote areas of the Beaufortain taken in on the Snowshoe Traverse of the Beaufortain. Soon we are overlooking the still waters of the Lac de St Guerin. A great spot to enjoy our picnic. Our snowshoes carry us down to twards the lake before we turn homewards. Mon – A very short distance from Areches-Beaufort is the hamlet of La Dray. Close to the small chapel where we put on our snowshoes. A gentle ascent through the snow-covered alpine pastures leads us into the forest. We look out through the trees towards Mont Blanc and the Col du Pre. Standing still for a moment the silence of the mountains is only broken by the chirps of birds in the trees, the sun sparkling on the snow crystals drifting in the crisp mountain air. The trees give way to more pastures and several traditional wooden mountain chalets thickly covered in the winter snows. Our descent from Plan Villard takes us down through more pastures to the hamlet once again. Return to the hotel to pick up bags and shower before heading for the airport. NB. Please note this itinerary may be modified to suit the prevailing conditions and the group. Min / Max Group size: 2 / 8 (Please contact me for Private Group tours and Custom Tours).